Appendix vermiformis is a narrow, blind-ended tubular organ connected to the cecum. Acute inflammation of the appendix vermiformis is known as acute appendicitis. Acute appendicitis is one of the most common inflammatory diseases of the gastrointestinal tract. It is related to obstruction, reduction in the blood supply, ischemic damage in the mucosa, and bacterial infection. The inflammation of other abdominal regions may also affect the appendix. In approximately 20% of such cases, no pathologic findings of acute inflammation are found. The effect of parasites on the causation of acute appendicitis has been debated for a long time. Parasites found in the appendix can cause symptoms of acute appendicitis, but parasitic infection is rarely the cause of acute appendicitis.,,,, There is a wide spectrum of pathologic findings, ranging from nonspecific changes to perforated appendicitis. 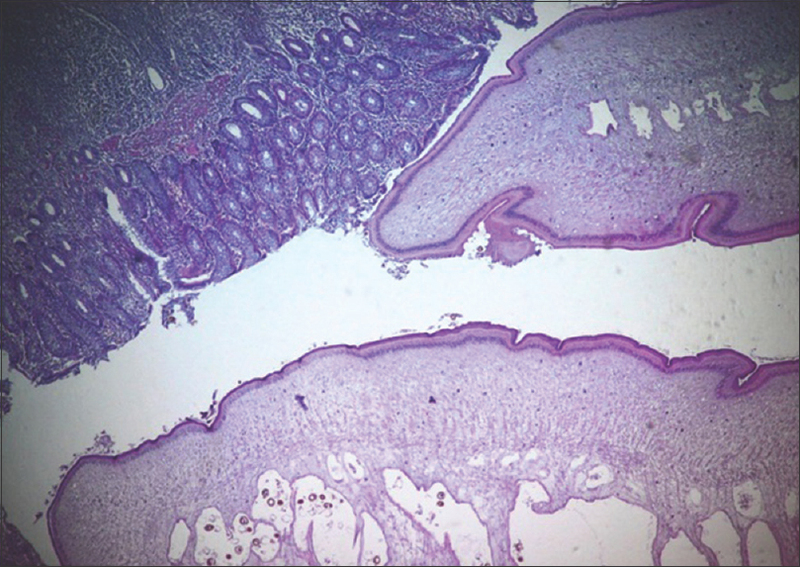 With a careful pathological examination, appendectomy specimens may reveal helminths and their ova parasitizing in the colon. Enterobius vermicularis is the most common parasitic infection in developed countries and is the most common parasitic agent causing acute appendicitis.,,, It may be responsible for symptoms of appendicitis in the right lower abdominal area.,, The eggs are elongate-oval in shape. They are surrounded by a thin wall. They include infective larvae. Schistosomiasis is a rare, chronic, infectious disease caused by Schistosoma haematobium. It rarely causes acute appendicitis. Parasitic infestations should be considered in patients with acute appendicitis. Parasitic infections can cause inflammation in the appendix and can imitate acute appendicitis clinically. 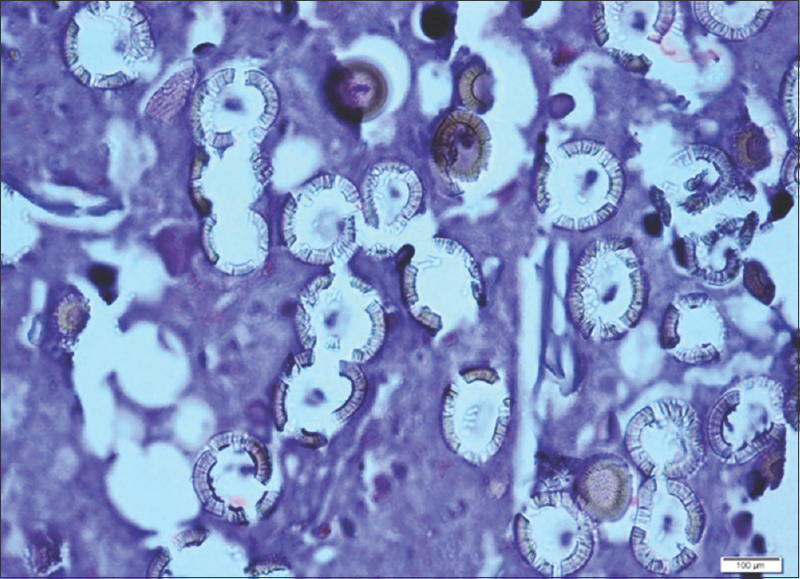 Detection of the parasite in the appendectomy specimen allows early treatment of the patient with parasitosis. 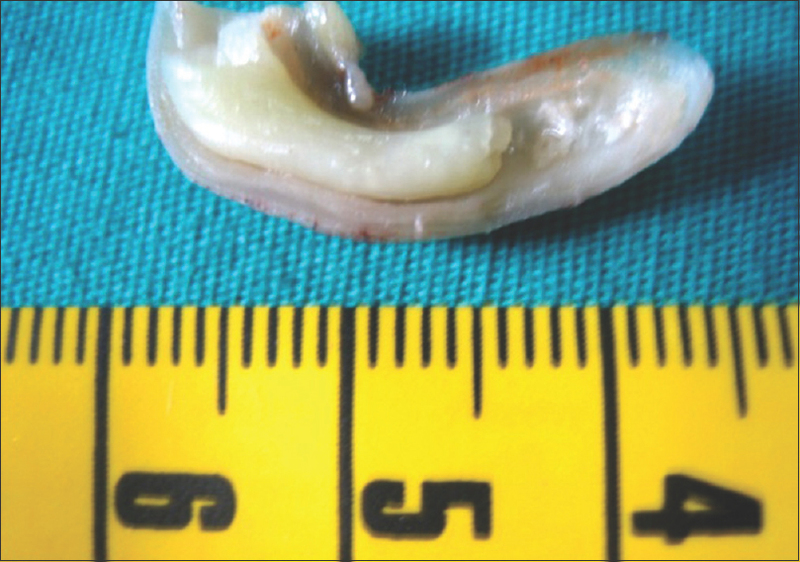 In 2400 appendectomy specimens, it is aimed to share the results of parasitosis causing acute appendicitis and to contribute to the treatment and follow-up of patients. Patients who underwent appendectomy due to acute appendicitis were included in this study. Patients who underwent incidental appendectomy due to other surgeries were excluded from this study. In this study, we retrospectively analyzed the data of 2400 patients who underwent appendectomy with prediagnosis of acute appendicitis between 1st January 2004 and 31st March 2018 at Erzincan University, Mengucek Gazi Education and Research Hospital. A tissue-embedded paraffin block was prepared from the appendectomy specimen of each patient. Two sections of 4-μm thickness were prepared from each tissue-embedded paraffin block. 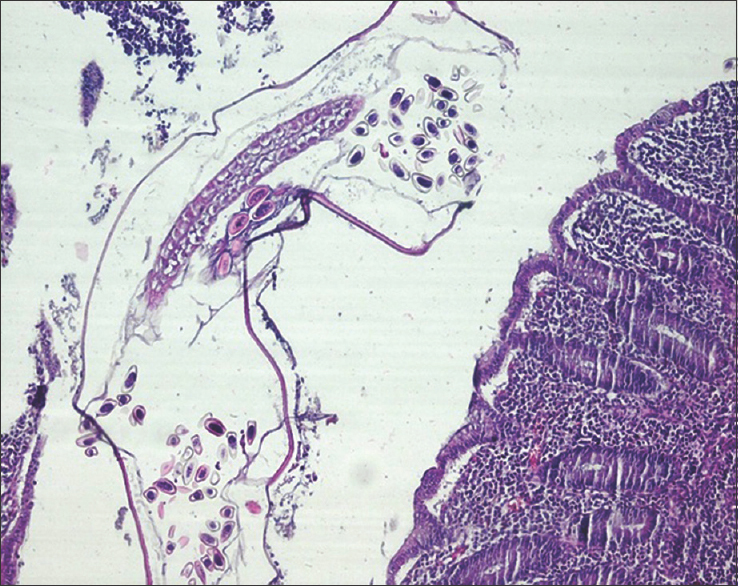 These sections were stained with hematoxylin–eosin stain. The pathological slides of all appendectomy specimens were re-evaluated. The appendectomy specimens were classified as positive or negative according to acute appendicitis features. The positive appendectomy specimens for acute appendicitis features were classified into four groups: catarrhal appendicitis, suppurative appendicitis, gangrenous appendicitis, and perforated appendicitis. We analyzed the ratio of parasites causing acute appendicitis in appendectomy specimens. The age of the patient, gender of the patient, type of acute appendicitis, and type of parasite were retrospectively analyzed. Descriptive summary statistics were obtained for all independent and outcome variables. P values of less than 0.05 were considered to indicate statistical significance. Statistical analysis was done using SPSS statistical software (IBM SPSS Statistic for Windows, Version 20.0; IBM Corp., Armonk, NY, USA). 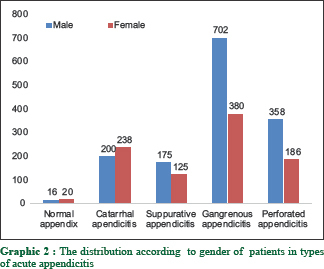 In this study, 1451 (60.5%) of 2400 appendectomy cases were males and 949 (39.5%) were females. The mean age was 25.51 years (24.13 in males and 27.64 in females). The age range was 1–93 years. Patients' gender ratio was 1.5. 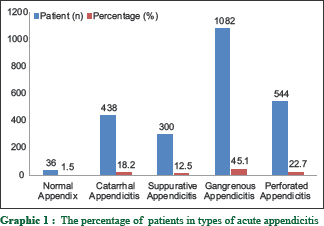 Of the 2400 appendectomy cases, catarrhal appendicitis was seen in 438 cases (18.2%), suppurative appendicitis was seen in 300 cases (12.5%), gangrenous appendicitis was seen in 1082 cases (45.1%), and perforated appendicitis was seen in 544 cases (22.7%). No acute inflammation was seen in 36 (1.5%) appendectomy specimens [Graphic 1]. Distribution according to gender is shown in [Graphic 2]. The incidence of gangrenous appendicitis was statistically significantly higher than other types of acute appendicitis (P < 0.05). Parasites were identified in 32 cases. The ratio of appendices to parasites in all appendectomy cases was 1.3%. Nine patients were males and 23 were females. Enterobius vermicularis was seen in 22 (0.9%) cases and Taenia species in 10 (0.4%) cases. The mean age of the patients with the parasite was 23.68 years. In cases involving Enterobius vermicularis, the mean age was 17.68, with a mean age of 14.57 for males and 19.13 for females. In cases with Taenia species, the mean age was 36.90 years, with a mean age of 39.02 years for males and 36.37 years for females. Patients with Enterobius vermicularis were younger than patients with Taenia species. Both Enterobius vermicularis and Taenia species were statistically significantly higher in females (P < 0.05). There were 7 male and 15 female patients with Enterobius vermicularis. Therewere two male and 8 female patients with Taenia species [Graphic 3]. The distribution according to the histopathologic type of appendicitis of these 22 cases with Enterobius vermicularis was 6 in catarrhal appendicitis, 5 in suppurative appendicitis, 6 in gangrenous appendicitis, and 5 in perforated appendicitis. The distribution according to the histopathologic type of appendicitis of these 10 cases with Taenia species was 3, 3, 2, and 2, respectively. There was no statistical significance between the types of acute appendicitis with the presence or absence of parasitic infestation (P > 0.05). In the study by Altun et al. conducted among 660 patients, the mean age was 19.6 years. In the study by Yilmaz et al. among 1621 patients, the mean age was 36.7 years. In this study, the mean age was 25.51 years (24.13 years for males and 27.64 years for females). Zakaria et al. found that the percentage of patients with suppurative, gangrenous, or perforated appendicitis was similar in both groups with no statistical significance, irrespective of the presence or absence of parasitic infestation. Similarly, we found no statistical significance related to the presence or absence of parasitic infestation. The ratio of negative appendectomy was 3% (14/480) and two times more common in females in the study by Jat et al. In this study, this ratio was 1.5% (36/2400). The ratio of distribution by the type of parasites in appendectomy specimens is different in several studies. Da Silva et al. found 24 parasites (1.5%) in 1600 surgically removed appendices. Enterobius vermicularis was found in 23 of 24 (95.8%) appendectomy cases, and Taenia species was detected in only 1 (4.2%) case. In the study by Zaghlool et al., the parasite was seen in 6 of 1536 patients. Enterobius vermicularis was present in four of the six patients with the parasite. The ratio of Enterobius vermicularis in patients with the parasite was 66%. 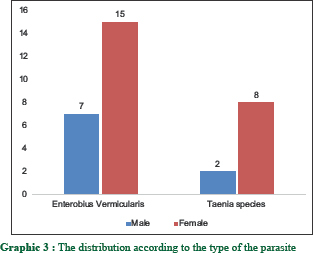 In this study, Enterobius vermicularis was present in 22 (68.75%) patients [Figure 1], and Taenia species was present in 10 (31.25%) [Figure 2] of 32 patients who underwent appendectomy involving the parasite. The incidence of parasites in patients in this study was similar to that in the research by Zaghlool et al. Enterobius vermicularis is the most common worm found in the appendix, particularly in children and adolescents. Similarly, in this study, patients with Enterobius vermicularis were younger than patients with Taenia species. The mean age was 18.1 years in patients with Enterobius vermicularis (14 in males and 20 in females) and 38.2 years in patients with Taenia species (39 in males and 38 in females). Interestingly, in one case, we found two Taenia species in the lumen of an appendix [Figure 3]. There was no such condition in the reported literature. There were many eggs in the lumen of the appendix and the inside of Taenia species [Figure 4]. As a result, we can say that pathologists must be careful to distinguish parasites from other materials such as artefact and fecalith in the appendix lumen. Even though they are a rare cause of acute appendicitis, parasitic infestations must always be considered. Accurate identification of acute appendicitis and appropriate therapy will improve the patient's quality of life as much as preventing acute appendicitis from parasites. Becker K, Höfler H. Pathology of appendicitis. Chirurg 2002;73:777-81. Lamps LW. Appendicitis and infections of the appendix. Semin Diagn Pathol 2004;21:86-97. Jat MA, Al-Swailmi FK, Mehmood Y, Alrowaili M, Alanazi S. Histopathological examination of appendicectomy specimens at a district hospital of Saudi Arabia. Pak J Med Sci 2015;31:891-4. Ishikawa H. Diagnosis and treatment of acute appendicitis. JMAJ 2003;46:217-21. Rosai J. Rosai and Ackerman's Surgical Pathology. Appendix. 10th ed. China: Mosby; 2011. p. 714-6. Bhangu A, Søreide K, Saverio SD, Assarsson JH, Drake FT. Acute appendicitis: Modern understanding of pathogenesis, diagnosis, and management. Lancet 2015;386:1278-87. Zakaria OM, Zakaria HM, Daoud MY, Al Wadaani H, Al Buali W, Al-Mohammed H, et al. Parasitic infestation in pediatric and adolescent appendicitis: A local experience. Oman Med J 2013;28:92-6. Karatepe O, Adas G, Tukenmez M, Battal M, Altiok M, Karahan S. Parasitic infestation as cause of acute appendicitis. G Chir 2009;30:426-8. Yildirim S, Nursal TZ, Tarim A, Kayaselcuk F, Noyan T. A rare cause of acute appendicitis: Parasitic infection. Scand J Infect Dis 2005;37:757-9. Callı G, Ozbilgin M, Yapar N, Sarıoǧlu S, Ozkoc S. Acute appendicitis and coinfection with enterobiasis and taeniasis: A case report. Turkiye Parazitol Derg 2014;38:58-60. El Khil KA, Zitouna MM, Chadli A, Maamouri MT, Kennou MF, Ben Rachid MS. Appendicular taeniasis. Report of 3 cases. Arch Inst Pasteur Tunis 1980;57:349-54. Lejbkowicz F, Abel AB, Tsilman B, Cohen, H.I. Taenia infestation in the appendix: A report of two cases. J Med Microbiol 2002;51:90-1.
da Silva DF, da Silva RJ, da Silva MG, Sartorelli AC, Rodrigues MA. Parasitic infection of the appendix as a cause of acute appendicitis. Parasitol Res 2007;102:99-102. Marjorie JA, Robert LG, Jonathan IG, Sue H, Donna AC. Clinical manifestations of appendical pinworms in children: An institutional experience and a review of literature. Pediatr Surg Int 2004;20:372-5. Chernysheva ES, Morshneva ES. Morphological diagnosis of various helminthiases during analysis of surgical specimens of appendices. Arkh Patol 2002;64:37-41. Zaghlool DA, Hassan AA, Ahmed MA, Faidah HS. Incidental parasitic infections in surgically removed appendices: A retrospective analysis. J Egypt Soc Parasitol 2015;45:571-8. Thanikachalam MP, Kasemsuk Y, Mak JW, Sharifah Emilia TS, Kandasamy P. A study of parasitic infections in the luminal contents and tissue sections of appendix specimens. Trop Biomed 2008;25:166-72. Akbulut S, Tas M, Sogutcu N, Arikanoglu Z, Basbug M, Ulku A, et al. Unusual histopathological findings in appendectomy specimens: A retrospective analysis and literature review. World J Gastroenterol 2011;17:1961-70. Yıldız T, İlçe Z, Turan G, Bozdaǧ Z, Elmas B. Parasites in the etiology of pediatric appendicitis. Turkiye Parazitol Derg 2015;39:190-3. Uysal E, Dokur M. The helminths causing surgical or endoscopic abdominal intervention: A review article. Iran J Parasitol 2017;12:156-68. Efraimidou E, Gatopoulou A, Stamos C, Lirantzopoulos N, Kouklakis G. Enterobius vermicularis infection of the appendix as a cause of acute appendicitis in a Greek adolescent: A case report. Cases J 2008;1:376. Risio D, Rendine A, Napolitano L, Schiavone C. Appendicitis by Enterobius vermicularis presenting with recurrent abdominal pain and eosinophilia A case report. Ann Ital Chir 2016;29;87. Lala S, Upadhyay V. Enterobius vermicularis and its role in paediatric appendicitis: Protection or predisposition? ANZ J Surg 2016;86:717-9. Ajao OG, Jastniah S, Malatani TS, Morad N, El Tayeb EN, Saif SA, et al. Enterobius vermicularis (pinworm) causing symptoms of appendicitis. Trop Dr 1997;27:182-3. Aydin O. Incidental parasitic infestations in surgically removed appendices: A retrospective analysis. Diagn Pathol 2007;24;2:16. Sartorelli AC, da Silva MG, Rodrigues MA, da Silva RJ. Appendiceal taeniasis presenting like acute appendicitis. Parasitol Res 2005;97:171-2. Singh NG, Mannan AA, Kahvic M. Acute amebic appendicitis: Report of a rare case. Indian J Pathol Microbiol 2010;53:767-8. Andrade JE, Mederos R, Rivero H, Sendzischew MA, Soaita M, Robinson MJ, et al. Amebiasis presenting as acute appendicitis. South Med J 2007;100:1140-2. Karagulle E, Turan H, Turk E, Kiyici H, Yildirim E, Moray G. Abdominal actinomycosis mimicking acute appendicitis. Can J Surg 2008;51:E109-10. Liu V, Val S, Kang K, Velcek F. Case report: Actinomycosis of the appendix – An unusual cause of acute appendicitis in children. J Pediatr Surg 2010;45:2050-2. Peitsidis P, Papadimitriou C, Rodolakis A, Peitsidou A. Actinomycosis of the appendix and pelvis: A case report. J Reprod Med 2008;53:711-3. Gali BM, Nggada HA, Eni EU. Schistosomiasis of the appendix in Maiduguri. Trop Doct 2006;36:162-3. Chamisa I. A clinicopathological review of 324 appendices removed for acute appendicitis in Durban, South Africa: A retrospective analysis. Ann R Coll Surg Engl 2009;91:688-92. Dorfman S, Cardozo J, Dorfman D, Del Villar A. The role of parasites in acute appendicitis of pediatric patients. Invest Clin 2003;44:337-40. Wani I, Maqbool M, Amin A, Shah F, Keema A, Singh J, et al. Appendiceal ascariasis in children. Ann Saudi Med 2010;30:63-6. Yabanoǧlu H, Aytaç HÖ, Türk E, Karagülle E, Calışkan K, Belli S, et al. Parasitic infections of the appendix as a cause of appendectomy in adult patients. Turkiye Parazitol Derg 2014;38:12-6. Altun E, Avci V, Azatcam M. Parasitic infestation in appendicitis. A retrospective analysis of 660 patients and brief literature review. Saudi Med J 2017;38:314-8. Yilmaz M, Akbulut S, Kutluturk K, Sahin N, Arabaci E, Ara C, et al. Unusual histopathological findings in appendectomy specimens from patients with suspected acute appendicitis. World J Gastroenterol 2013;19:4015-22. Zaghlool DA, Hassan AA, Abd El M, Ahmed F, Faidah HS. Incidental parasitic infections in surgically removed appendices: A retrospective analysis. J Egypt Soc Parasitol 2015;45:571-8. Engin O, Calik S, Calik B, Yildirim M, Coskun G. Parasitic appendicitis from past to present in Turkey. Iran J Parasitol 2010;5:57-63. Hajar ZH, Abdolhossein D, Maryam G, Samira ER, Fakhar M. Study on verminous appendicitis and its histopathologic lesions at teaching hospitals of Mazandaran University of Medical Sciences during 2005–2009. J Mazandaran Univ Med Sci 2013;23:1-7.